Mount Stromlo is a popular destination for both Canberrans and visitors to our city. Many of us have spent time there visiting the famous observatory and enjoying bush walking, riding and picnicking while taking in the commanding views over Canberra. But there is one landmark a little off the beaten track that many of us may have missed. 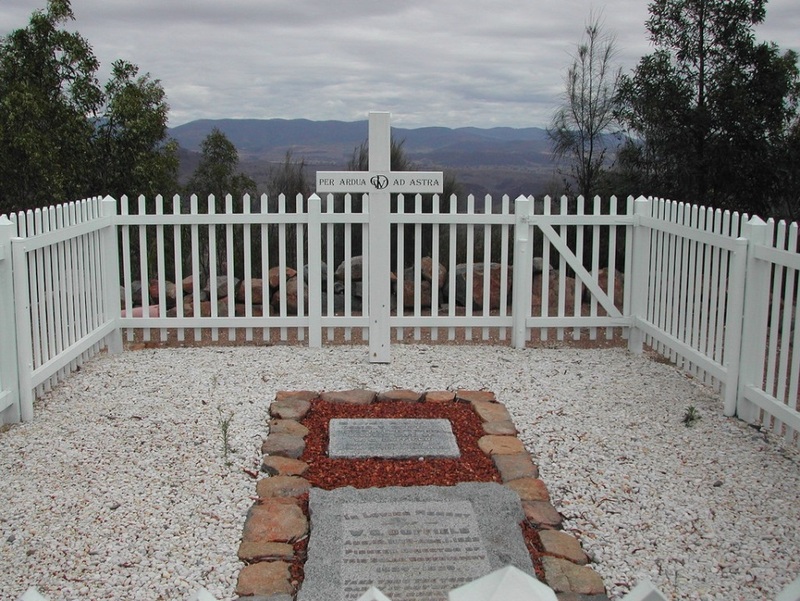 If you venture off the Heritage Trail to the western slopes of Mount Stromlo overlooking the Murrumbidgee Valley, you will find the lonely grave of Walter Geoffrey Duffield. 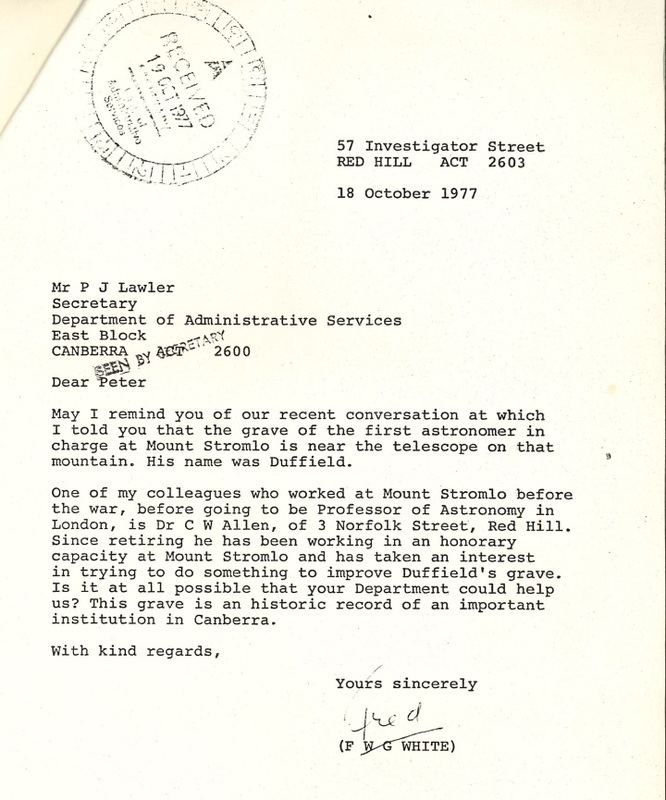 Who was Duffield and why does his grave sit alone atop Mount Stromlo? 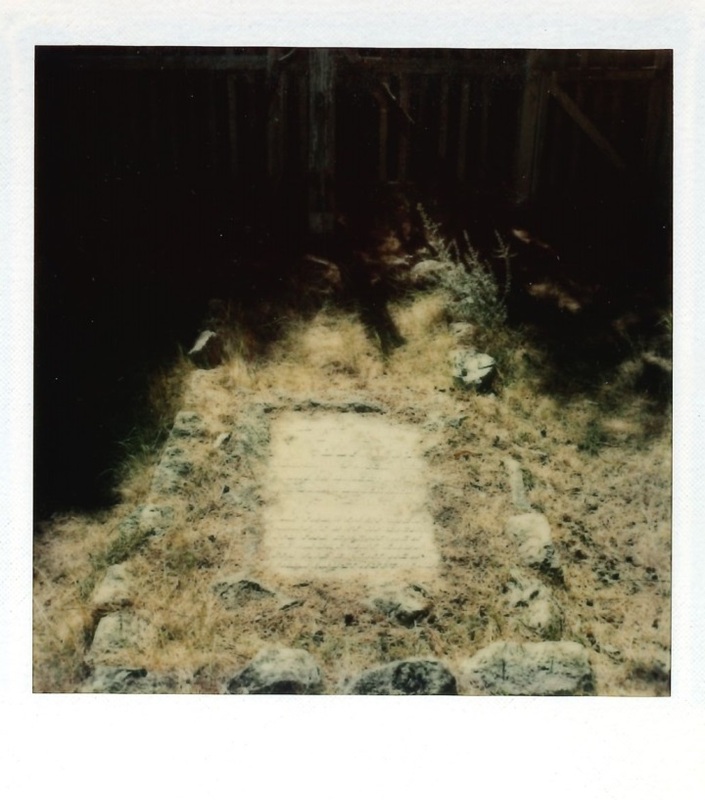 Walter Duffield was instrumental in putting Canberra on the astronomical map and the story of his untimely death and unusual grave site is a fascinating part of our local history. 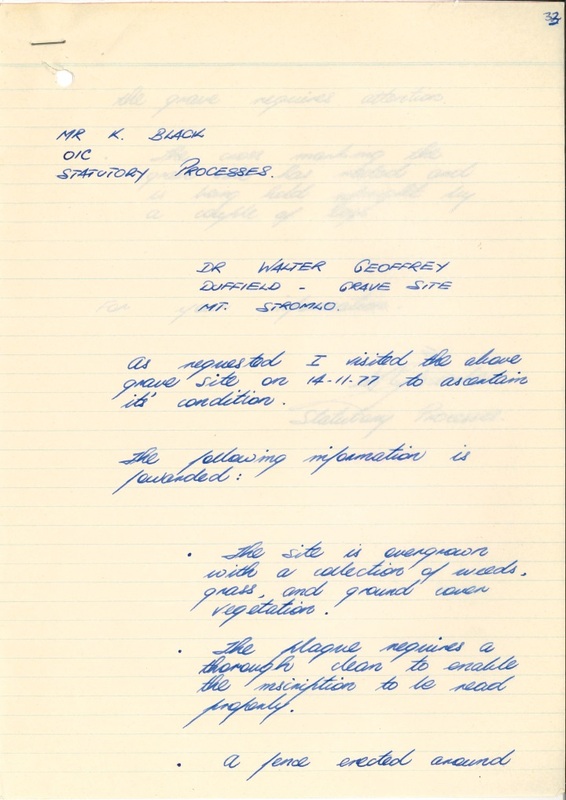 Records relating to Walter Duffield’s final resting place on Mount Stromlo are ArchivesACT’s June Find of the Month. Duffield was not a Canberra native, but he became an important member of the community. Born in South Australia in 1879, he showed great talent for engineering and physics, and spent much of his early career in England. It was while working and attending conferences overseas that Duffield began to ponder the lack of a solar observatory in Australia, and subsequently began to lobby for the development of such a facility in Eastern Australia. …It was important that Australia should participate in this work, because there is no observatory of the kind in the same latitude between America and India, and such an institution would fill a gap in the chain already existing around the Earth, and enable the Sun to be kept under continuous observation during the whole 24 hours. From 1910 - 1913, Victorian Government Astronomer Pietro Baracchi and his colleagues established a small observatory at Mount Stromlo to conduct testing for the proposed solar observatory. Testing was favourable and Stromlo was chosen, although it was 1923 before the government proceeded with construction. After working tirelessly to establish an Australian observatory, Duffield was appointed as the inaugural Director of the Commonwealth Solar Observatory (Mount Stromlo Observatory) and held this position from 1924 until 1929. Duffield and his family relocated to Canberra, taking up residence in Hotel Canberra for close to three years. Hotel Canberra, originally known as Hostel No. 1, was built as accommodation for Commonwealth officials and dignitaries. It is now well-known to locals as the Hyatt Hotel. 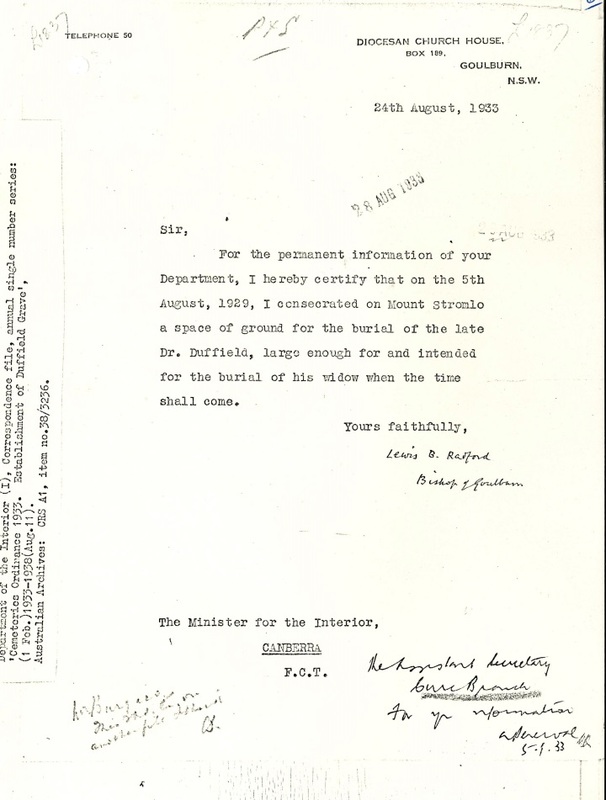 In 1924 Duffield and family had the honour of being the first guests and Duffield occupied himself with establishing a makeshift observatory from the hostel’s pavilion while the Stromlo buildings were constructed. In 1928 the Duffield Family finally moved to Stromlo. 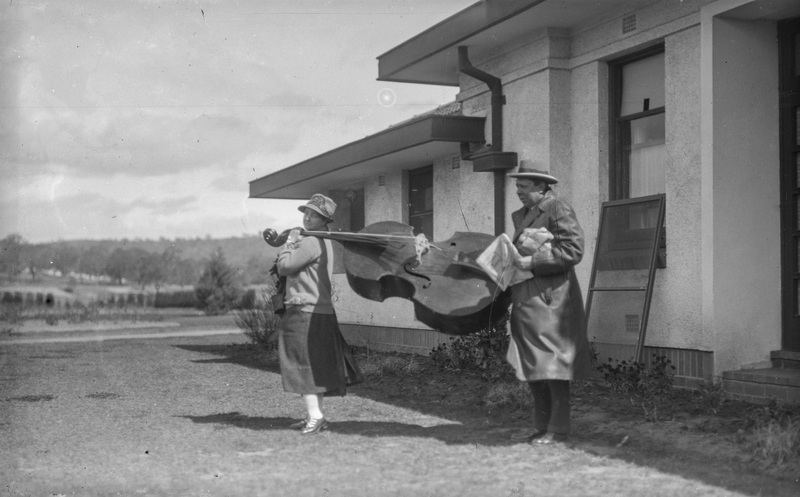 Walter and Doris Duffield played in the Stromberra Quintet – credited with performing Canberra’s first philharmonic concert – and became involved in the local community through Rotary. Doris was also the first president of the Canberra Mothercraft Society. In the very cold and snowy winter of 1929, Canberra experienced an influenza epidemic and in July, Walter Duffield contracted the illness sweeping the city. It soon developed into pneumonia and on August 1st he tragically passed away at the age of just 49. 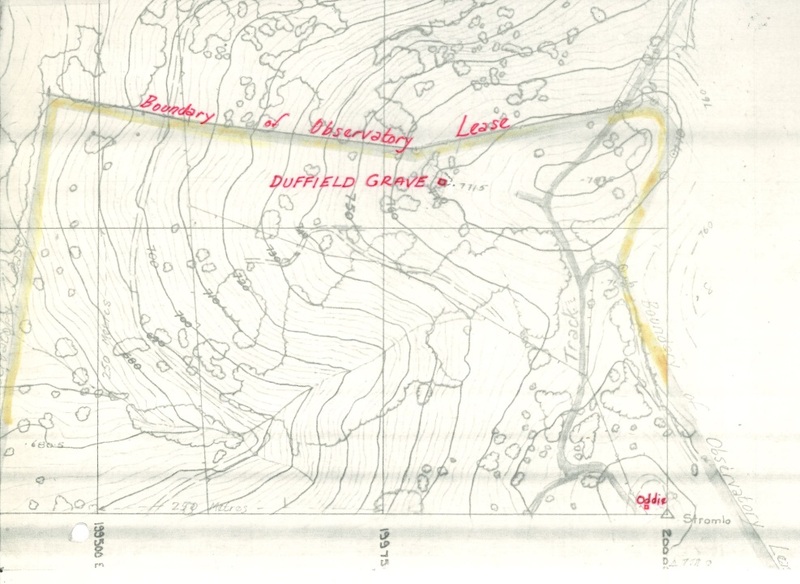 On a rainy August day, Duffield was laid to rest on the mountain. Such was the respect for Duffield in the community that despite the steep, narrow road up to Stromlo and the need to walk half a mile along a wet, rocky and precipitous track to his grave site, his funeral was very well attended by the Canberra community. Attendees included a number of Commonwealth officials, members of the local Rotary Club and RSL and Duffield’s Observatory colleagues, six of whom carried his coffin. The simple wooden cross that marked his grave was enamelled with the Royal Flying Corps coat of arms and motto “Per ardua ad astra” (“Through adversity to the stars”). Duffield had served with the RFC during the First World War. …The remembrance of two mountain tombs, overlooking Canberra, would always remind them of the Christian soldier who died defending the ideals for which Canberra stood, and a Christian scientist, who died in developing them. The Duffield Family remained in Canberra following Walter’s death and it was their desire that saw him receive a final resting place close to the observatory that he worked so tirelessly to establish. They had the support of Bishop Radford, who agreed to consecrate an area on Mount Stromlo for the burial of Duffield. Around the time of Duffield’s death, government officials were drafting a formal ordinance addressing the management of general and special cemeteries and burial places throughout the ACT. This became Ordinance No. 29 of 1933, An Ordinance Relating to the Establishment, Management and Control of Cemeteries. A letter from the Assistant Secretary of the Federal Capital Commission, C.S. Daley, to Duffield’s widow Doris, in February 1933 informed her that the ordinance had taken longer than expected to legislate “owing to a long series of negotiations with the various Church authorities”. 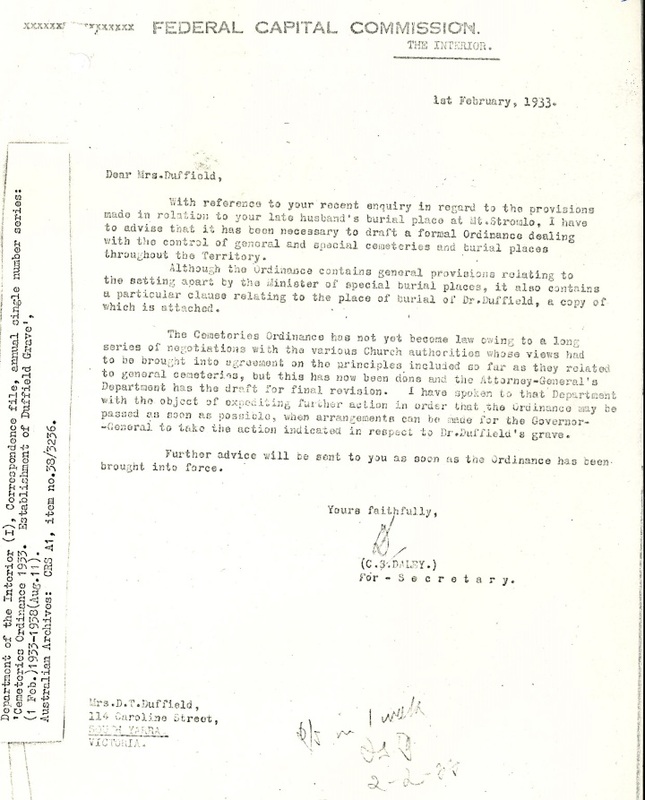 Notably, when the ordinance was finally notified on 23rd November 1933, Section 22 dealt specifically with the “place of burial of Dr Duffield” in an area described as a “piece of land containing not more than nine-tenths of a perch” (around 23 square metres). It stated that two trustees would be appointed to oversee the maintenance of the grave, Walter’s widow Doris and Mr Percy Lempriere Sheaffe, former Chief Government Surveyor. The ordinance also specified that no other person than Doris Duffield was to be buried in this location in the future. Doris Tennant Duffield died in the Canberra Community Hospital on 12th June 1956, almost 30 years after her husband, with a plaque placed at her husband’s grave at Mount Stromlo. In 1963, the other appointed trustee, Percy Lempriere Sheaffe also died at the Canberra Community Hospital. By the 1970s, it had become clear that Walter Duffield’s grave was badly deteriorating, with no other trustees having been appointed following the deaths of the original trustees. 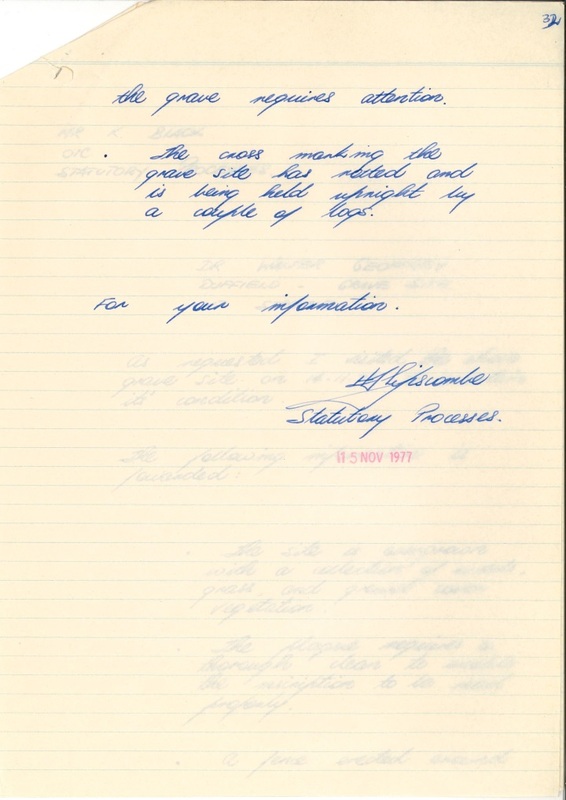 Correspondence from distinguished physicist and former CEO of the CSIRO, Sir Frederick White, highlighted the dissatisfaction at the state of the grave site and the pressing need to appoint new trustees and instigate repairs. 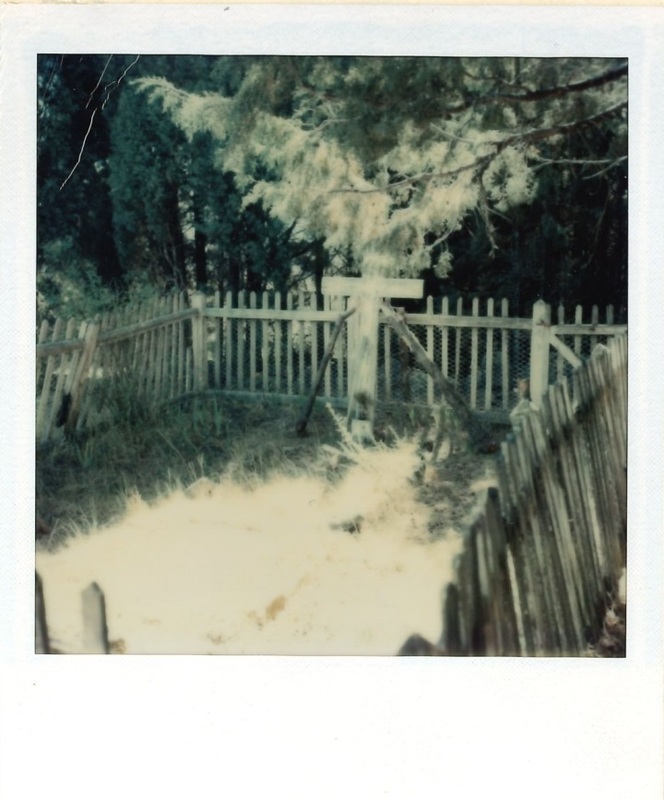 Photographs of the grave site taken in 1977 illustrate White’s concerns, and a letter from H.J. Lipscombe to Mr Kevin Black, Officer in Charge of Statutory Processes, details a variety of issues. These included the need to clear vegetation, clean the plaque and conduct repairs to the fence surrounding the grave and the cross marking the grave site, which was being held in place by logs. Miss Duffield became a passionate supporter of Mount Stromlo Observatory and the ANU, establishing two endowments including the Duffield Chair in Astronomy to honour her father, and funding repairs to the observatory’s heliostat following the devastating 2003 Canberra Bushfires. She died in 2014 at the age of 104. With the necessary repairs completed, the grave of Walter Duffield was restored and has once again become a fitting final resting place for a man who worked tirelessly to further astronomical research in Australia. Have you visited Walter Duffield's grave at Mount Stromlo? Why not tweet us and don’t forget to include @ArchivesACT. If you are interested in further research on this topic, please contact ArchivesACT through our “Request a Record” service. *Stromlo Forest cultural resource survey and conservation plan. Final report, 25 June 1990. Prepared by David Bulbeck and Philip Boot for ACT Forests, ACT Parks and Conservation Service, Office of City Management, 1990.